For the first time in Lancashire League history both Burnley and Lowerhouse will compete in the Worsley Cup final. Remarkably it’s taken 93 editions of the competition to get to this stage but, at long last, the town’s big rivals will battle it out for one of the most prestigious amateur trophies on offer. Burnley, who created history when winning it for a fourth time on the bounce in 2016, reached the showpiece at Liverpool Road on August 5th by beating Todmorden by five wickets. There were almost 500 runs scored at Centre Vale which saw Kai Abbas top score with a run a ball 51 in the home side’s 237-9. Ben Pearson made 42, sub professional Qaiser Abbas 24, Ben Sutcliffe 20, skipper Andrew Sutcliffe 18 and Bilal Abbas 14 as Joe McCluskie took 4-29 for Burnley. Burnley’s past and present professionals then combined to send their side on the way to glory. Chris Holt and Asif Zakir put on 138 for the second wicket with the former hitting nine fours and a six in making 75 from 100 balls while his paid man hit 10 boundaries in a knock of 86. Joe McCluskie hit a swift 27 before Chris Burton (11 not out) and skipper Dan Pickup saw Burnley home in the 49th over. Lowerhouse advanced to the final stage with a 92 run win over Crompton at the Brooks Foundation Ground. Captain Ben Heap top scored with 66 in his sides 184 all out, finding the boundary on eight occasions. Chris Bleazard hit an unbeaten 27 to add vital runs at the end of the innings. Burnley also made it to Twenty20 Finals Day for the first time in the club’s history by beating Crompton by seven wickets at The MyProtein Turf Moor. Holt took 3-4 and Cole Hayman 2-6 to bowl the away side out for 81 after 16 overs. Professional Aubrey Swanepoel made 21 and openers Mohammad Jamal and Aqib Zulfiqar 19 apiece. Holt then hit 41 with Zakir adding an unbeaten 33 to see Burnley to victory in the 12th over. Finally, it was the West Enders who came out on top in the Battle of Burnley. Heap’s men climbed to second spot in the Lancashire League table with an eight wicket win on enemy territory. 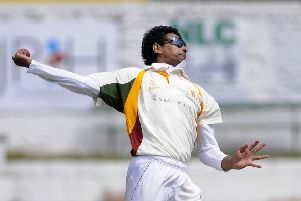 Lowerhouse sub professional Akbar ur Rahman was the man of the moment, taking 4-45 to dismiss Burnley for 196 before firing an unbeaten 66 to guide his side home in the 44th over. McCluskie had top-scored for the hosts with 66 with Joey Marshall making 25, Holt 20 and professional Zakir and skipper Pickup adding 19 apiece. Francois Haasbroek took 3-57 in Burnley’s innings and then hit an unbeaten 27 in the chase. Heap also hit 51 with Charlie Cottam posting 28. “We started well and finished well but the in-between wasn’t so good,” said Pickup. “We can’t complain too much though. “We would obviously have liked to win all three but I think the defeat to Rishton beforehand had dented our title hopes. “I’m not saying I thought we were completely out of it but it was going to be a massive challenge for us.